Ontopoiesis is a fascinating concept introduced by Anna-Teresa Tymieniecka in the phenomenological context to express a rich range of meanings. In this chapter I would like to draw its rational bounds. Especially, what I aim to show is the relationship between ontopoiesis, logos and antiquity. En effect, I would like to sketch in the balance between creative energies of ontopoiesis and the layers of reality on which they are applied. 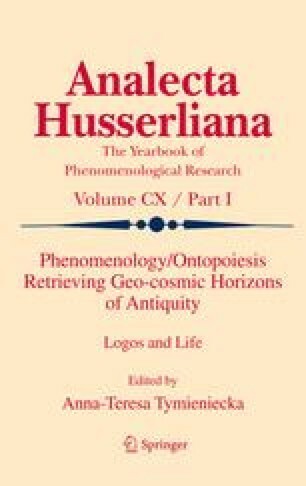 From a phenomenological point of view, namely from an Husserlian one, Tyminiecka shows a path by which the phenomenologist marks out the meaning of this concept. Here, I am going to be focused particularly on Husserl’s definition of spiritual and creative life. Effectively, in the sixth chapter of Husserliana XXXVII, he talks about the spiritual life by the hermeneutic instrument of dynamis, pointing up its rational and irrational aspects. In fact, it is not clear if Husserl conceives this kind of dynamis as rational at all. Therefore what I want to examine here is whether ontopoiesis might be enlivened by irrational sentiments like ancient ate or menos or if it is an Apollinean energy that inspires our souls.